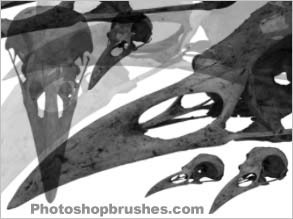 This is one of the latest photoshop brushes sets to be added to the site featuring five very large crow skull brushes, these all face to the left but to get them to face right just transform and flip the layer they are applied to. Will also be releasing a 5+ meg file of these (very hi print resolution) Hope you enjoy the new set, more coming very soon. There are far more Skull Photoshop Brushes available on the site.